Wondering where to get the free comic book day comics? Don’t worry, we have all the details! Here are all of the Free Comic Book Day Tips you need to have an awesome experience at the event. Free comic book day is always held on the first Saturday in May. Independent comic book stores give away comic books and they are totally free. We love free! My son LOVES comic books. 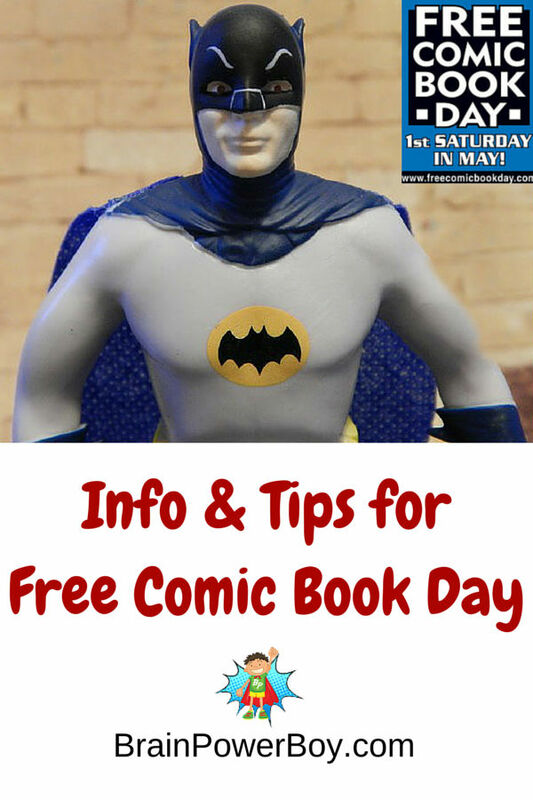 We have gone to free comic book day for many years now and I have a few tips to share. If you have a comic book loving kid, you will want to check out this fun event. Use these free comic book day tips to have an enjoyable time. Planning ahead is the key so that you and your kids know what to expect. Free comic book day is a day when independent comic book stores give out free comics. Take a quick look at this video and then scroll down for the tips that will help you make the most of this fun day out. The event is always on the first Saturday in May. If you need specific titles you will want to arrive early. Give the comic shop a call to see just how early you need to be there. There are sometimes long lines wrapping around the block! Be prepared to wait. If you are not too worried about titles and just want a few freebies, go about an hour and a half after the event begins. Most of the crowd will be gone and you can browse the shop and not have to wait in a long line. Do know that some of the comics to be gone though. An unusual approach is one we have used before. We were unable to go during the day and we swung by just before they closed. The selection was not great but we were able to take whatever we wanted at a shop that usually limits the number of free comics. What Can You Get Free? The free comics you can get are preselected. You cannot just pick comic books from the racks in the store. You go to a special area that they have set up for the giveaway and you may select from those comics. There are 50 free comic book selections this year. Not every store will have every comic book. The number of comic books you can get depends on the shop. We have been to some that allow you to take one of each selection available. Other shops allow only one comic book. Big difference! What Comic Titles Can You Get? Some of the comic books that are available are great for kids, others . . . not so much. Each family needs to decide for themselves what works best for their kids. Take some time to preview the free comic book day titles that are available (go here) and make a plan with your child. Talk about how many comics they may be able to get (call stores for details) and what titles you feel are acceptable. Having this discussion while standing in line will not be fun for anyone! Some of the comics are violent, have blood, and/or are sexual in nature. Again, I would preview before you go. I was picking out comic books for my son and I was more than a little surprised by a few of them. This is not an event that is just for kids. There is a crowd of people of all ages at free comic book day. We have seen some interesting costumes (& scantly clad women.) There have been masks as well, which could scare some kids. Most people do not dress up for this but sometimes people do or there are store employees in costume. We have also heard some swearing and rude/crude comments while waiting in line. I think a lot depends on your local store and the area the store is in. I also suggest deciding ahead of time if you are purchasing other items while at the store. I have seen many a crying child at free comic book day as they couldn’t get the comic they wanted because it was gone, or they wanted something else (not free) they saw instead. Comic books can be fun but they can also be expensive. The comic ends at a dramatic part so you “have to” purchase the next comic to see what happens. This can be tough for young readers. Explaining everything before you go can help. An alternative to buying in store is to grab some collections below and have a surprise come in the mail. It is less expensive by far. Where Can I go to Get Free Comics? Free comic book day is the first Saturday in May each and every year. Mark your calendars! The free comic books are available at independent comic book shops only. Go here to enter your zipcode to find the shop(s) nearest you. Be sure to find the owner or manager of the comic book shop and thank them for hosting this neat event! I hope you got a few good free comic book day tips. Planning ahead makes trips like this more enjoyable for everyone. Overall we have enjoyed the events and always come away with something fun to read. Comics are indeed a wonderful way to get boys reading. You might also like: magazines for boys, reviews and recommendations, and our big list of great books for boys. Wow that sounds brilliant! Great tips too especially around setting a budget with your child ahead of time – so much easier that way than anyone getting upset! What an awesome idea! I’m making a plan to take my grandchildren. Thanks for the information. Super Dedra. You are most welcome. Have fun! Thanks for the nice comment. I do find that when kids know what to expect things can go much more smoothly. I certainly agree with you that much of the info here can be used for boys and girls. I am glad to hear you love our boy focus. That makes my day. My son and I love Free Comic Book day 🙂 We both love DC comics (Batman especially) so we really do love this day. Thanks for sharing the tips! Yay, another DC Fan – DC is how we roll! Have fun and I hope you get some good comic books. I so appreciate the tips (and warnings)! This sounds like a lot of fun — and so cool that it’s on a Saturday! Thanks for your nice comment. It is fun! I am glad you appreciate the tips. Lovely guide. I am hoping to get the Doctor Who comic that I saw on the poster. Last year I got the neat one that was hardbound and had Mousehunt (? ), Labyrinth and so on. So cool. I have never seen a hardbound one before. Last year was one of the times we had to go late. Good luck with your Dr. Who quest. Super that you have 4 nearby (we would love that!) Hope your family members get a chance to go. Never knew this!! Thanks for sharing at our FB Share Day! You are most welcome. Hope you find a location near you. Went to your site after seeing your considerate comments every blog I went! You are such a supportive presence. This is great information! I am always so perplexed when you encounter someone who does NOT like comic books – we are bibliophiles, we love all stories told all ways possible, but had never heard of free comic book day! Big surprise since I am BIG on deals. Thanks so much for this and passing it on to my Facebook pals. Best wishes and following! Thanks so much for sharing this post. I really appreciate it. We are big comic book fans in this household 🙂 Thanks for your kind comment V. it means a lot. wow, this is so good to know. Is it nation wide? Actually Beth it is International! It is limited in some areas but is held all over the world at independent comic book shops.